We have spent many hours and thousands of euros making this a perfect villa in every way possible, each winter the villa is up graded in some way. The Villa has 4 bedrooms all with on-suite bathrooms that sleeps 11 guests in total comfort. In the last 10 years we have been very successful in letting the villa, July and August weeks can be fully booked almost a year in advance and many of our guest have been to the villa more than once, some even re-book before leaving. It is fully air conditioned with units that can heat as well as cool in all the major rooms and the bedrooms, making the Villa ideal for summer or winter breaks. The massive 700 sq foot lounge comes with a themed Budweiser bar, TV, DVD and Radio area and plenty of comfortable sofas. This leads out via the patio doors on to large covered patio that looks out on to the gardens with a good size pool with roman steps. At the end of the garden there is a a large BBQ and Portuguese wood burning bread oven. The garden has great countryside views and is private without any neighbours overlooking us, we are in a fantastic location as it has 2 supermarkets and many restaurant within a few minutes walk and its only a 20 minute walk to the beach. The small steps on the ground floor along with 2 x twin bedrooms downstairs means less able bodied guests can stay. The master bedroom has a balcony over looking the rear garden accessed via the large patio doors and also has a large private sun bathing balcony to the front of the villa. The other front bedroom also has it's own balcony accessed from the bedroom patio doors. Fell in love with the country, people and Vale de Parra, then found the perfect villa, well perfect after completely refurbishing it! £40,000 later, which we could not of done without our local agent Tony who looks after the property for us and looks after the guest staying with us. Due to the size of the villa we have now increased the sleeping capacity to 11 guests. The slow peaceful pace of life in Portugal is what makes these holiday breaks so special. The friendliness of the local’s residents is something that you will remember long after you get back home. My aim is to make your holiday so good you will want to come back again to stay in either this villa or another one that I arrange the lettings on. Some groups are on the 4th or 5th visit to us for their holidays this year, so come and see why. All sheets and linen is provided, you only need to bring your beach towels. private parking for 2 or 3 cars in large secure car port behind lockable gates. Yes all towels provided except for the beach. This very large living room of over 700sq feet has all all new funiture fitted which include sofas to seat 8 + fixed seating for 6 in TV area, plus a great themed Budweiser bar with large double fronted beer chiller, TV and DVD player & sound system. Kitchen has been recently fitted with new white goods and completely re-tiled. Comes with dishwasher, large fridge with freezer compartment, juicer, mircowave, toaster, table and chairs for 6, full compliment of kitchen utensils and crockery. Table and chairs in Kitchen for 6 plus outside tables and chairs for 12 under the covered terrace. 2 main bedrooms upstairs have private balconys, plus large balcony at the front of the villa for private sun worshipers. The Salgados Golf course is just a mile way with 2 new courses under construction close by. Along with 6 other courses within a 20 minute drive, our agent can arrange any golf you may require at discounted rates. Private pool with roman steps in south facing garden. Notes on accommodation: We have a brilliant local villa services agent "Tony" really goes the extra mile to make sure everything is just perfect for your holiday, he is only 1/4 mile from the villa. He and his family are just a phone call away. The air condintioning can also run in reverse to heat the rooms if required. 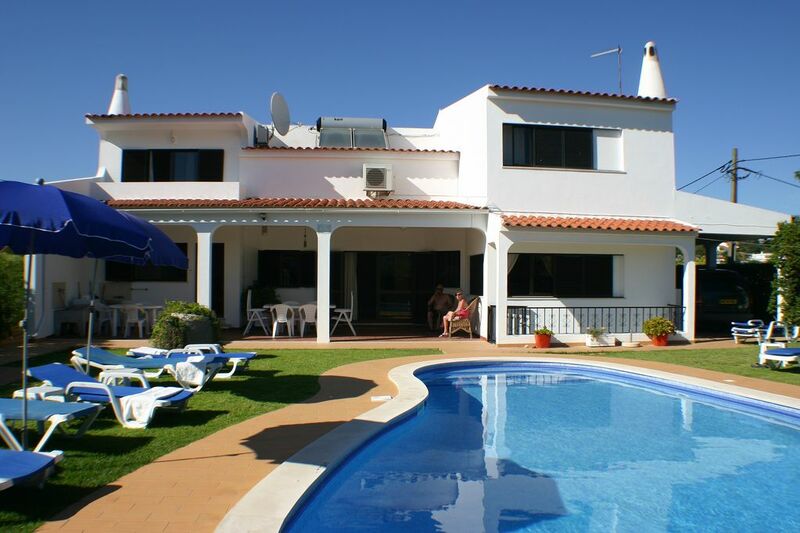 Outside: The villa has gardens all round, with a private pool in the rear south facing garden along with a BBQ area. The driveway leads to a car port to keep your car cool during those very hot sunny days will easily take 2 cars. There is an outside covered patio for those warm evenings for eating your barbecues and drinking the local plonk. All the facilities of the villa are all based on 9 people staying so no fighting over the sun loungers at Villa Fatima. Utility Room: Washing machine is outside next to the kitchen in the patio area. The maid has her own washing machine in building at the bottom of the garden next to the BBQ. The villa has its own ironing board and iron for use by the guests. Cleaning / Towels / Linen / Maid service: Price includes a maid service twice weekly, Saturday's and Wednesday's. A daily service can be arranged at extra cost. All linen and towels are provided other than beach towels. Our local agent will sort out any problems you may have. Other: The large dining room is ideal for Christmas and family parties etc. But outside there is a large covered patio with 2 tables and seating for 10 for alfresco dinning, so the dinning room rarely gets used. Just superb. Couldn't fault anything. Highly recommended. Property is beautiful; the area has everything .. with shops and restaurants a walk away (must try Sau Domingos) and the owners Steve and Sue went out of their way to cater for our needs (9 adults and two young children) and their agents on site sorted everything, especially countless taxi runs. Just fantastic. Burch family. We hope you will come back again in the future. Yes Tony and Dino always go the extra mile for all our guests. We have stayed at Villa Fatima before and have always loved the spacious villa, garden and pool. The 5th bedroom is a great addition as it suited our mixed party. We will be returning. Hi sally thanks for the great review, yes the villa is plenty big enough to have it sleep 11 guests, the extra bedroom makes it ideal for large family groups like yours, see you again soon i hope. We stayed at villa Fatima for 10 days and it is a lovely villa in a good location near some good restaurants, our favourite is Jompra which is about 10 minutes walk away. The villa is also near 2 good supermarkets the Spa and Oceano which is a bit bigger and has better fresh food. The villa itself just needs a few things to make it 5 stars. The upstairs bedrooms just need a bit of updating and the cleaner only came once which was a bit disappointing because the website said twice a week. The outside area is the best feature of the villa the pool is big and there is lots of sun lounger and chairs. You have to be careful of the little steps outside there is quite a few and they blend into the tiling, we had quite a few accidents tripping over but luckily nothing too serious. The pool wasn't cleaned while we were there so a lot of dead insects had gathered at the bottom. Just one last thing about the Wi-Fi. You shouldn't have to pay extra it is 2017 as Wi-Fi is everywhere you go without having to pay. I know I have had a few moans at the end of the review but I do think they are little things that could make the villa perfect. We have been to this area many times and it is definitely one of our best villas. Thanks for the your review, just a few answers to your points, maids come on Saturday's and Wednesday's, you may not of seen them on the day of your arrival due to your arrival time and they will of come in on the Saturday, they should of come on the following Wednesday so i will speak to my agent about that, but as you left on the Friday they may of skipped it. Re the WiFi charges this is an extra as not everyone wants it and it helps us to keep our rental rates competitive, we list it in the ad as an extra, but €15 is not excessive as we have to pay for the phone line all year to be able to provide it for your stay. I must a disagree about the bedrooms, I think the dark varnished wood on the floor and wardrobes makes it look less modern than at home but its a traditional Portuguese finish for wooden surfaces. The pool man does come weekly to do the chemicals you may of missed him if you were out, we provide a pool net for the removal of bugs in and on the water, we can not provide a daily pool man service without increasing the rental rates..I did mange to trip on step myself about 5 years ago but I was coming back from a loverly lunch at O'barco which involved one to many pints of Super Bock, we do ask in our villa information for our guests to familiarise themselves with the layout of the villa. But it sounds like we are not far from a 5 star review, which is what we strive for. Lovely villa. Clean, with all facilities as described. Pool was great and cleaned while we were there. Plenty of sunbeds and umbrellas . Everywhere was child friendly. Local supermarket delivered our first big shop and spoke good English and were friendly. Barco restaurant offers good choice of food and is very reasonable. We also had some great BBQ evenings in the villa. Representative there was very helpful and called twice to make sure everything was OK. Came back totally relaxed. We would love to go back again and would recommend the villa to friends. Yes we are very proud of the villa and its facilities, we spend most of the villa income on upgrading and improving the villa, which we hope shows in the quality of of villa. Unlike many companies that rent the villas we are hoping that our guests want to come back again and again, we have on group on there 4th visit to us, this is our home in the sun not a tired and worn out rental villa. this villa was fantastic. Beautifully refurbished and set in a wonderful quiet spot in the area of Gale. Close to shops and restaurants but far enough away to enjoy peace and tranquillity. The details on line did not do justice to the property. It was far nicer than expected. The beaches were a good walk away but not so far as to stop the oldies, ie. me and my husband, enjoying the exercise, taking in the sights around us. The family loved it and the agents were on hand to organise days out, taxis etc. Glad you enjoyed your stay in Villa Fatima. We hope to see you again in the future. I must try harder to show all the assets the villa has, its hard to do with pictures and text. But I hope these reviews will give a better idea of what the villa has to offer. Don't praise Tony and Dino to much they will increase there management fees. We have tried to make the villa a place were we would like to holiday, this is our home in the sun and I spend a lot of time on maintenance and improvements while I am on holiday there. Zoomairne is in Guia and gives you the chance to swim with the Dolphins, you need to prebook in the summer and it not cheap but well worth the money. Local horse riding, jeep safaris, boat trips, fishing, bike hire is also available locally. Sao Rafael Beach is 1 mile, Gale Beach 2 miles and this is one of best beaches in the Algarve this beach has mile after mile of golden sand with water sports for hire in the peak season and has a great 4 mile walk to the town of Armacao De Parra. There are about 7 other beaches within a 20 to 30 minute walk from the villa. Faro Airport is the nearest, 35 miles. Lisbon is about 100 miles away. Albufeira Town 4 miles. Tony our agent can arrange for airport transfers to the villa from Faro airport and back again. Car Hire can also be arranged either for collection from Faro airport or to be delivered to the villa, either for a few day or the whole of your holiday. The local area benefits from 2 supermarkets and 3 restaurants within a 5 minute walk of the villa with a further 8 restaurants within a 15 minute walk. There are many restaurants in the local area also the normal holiday activities are bookable including, boat trips, jeep safari's, horse riding, jet ski hire, bike hire, sea fishing, golf, water parks, etc. Booking Notes: Bookings must be made on our booking forms obtainable by emailing via links lower down page. 10% deposit for following year + 20% more in January, or 30% deposit at time of booking in year of departure. Final balance 6 weeks before departure. Plus a £200 refundable security deposit payable with final balance, deposit refunds are as per terms and conditions. This is a very popular villa with a high re-booking rate by our guests. Changeover Day: Peak season change over day is on Saturday, but please ask about other days as we will try to accommodate you if possible. Off season can be any day. Notes on prices: Prices are for the property per week in UK Pounds. Payment by Euro's is also accepted. Please note: long winter lets are always considered please email.